The Concourse might be the next trendy place to hangout for avid cafe-hoppers. This financial building (which is located at Beach Road) has recently witnessed a number of new cafes and restaurants (such as Tora, Le Canele d’Or, Pizza Face, Burger Beer Bistro and Big Sake Bar) opening within it. 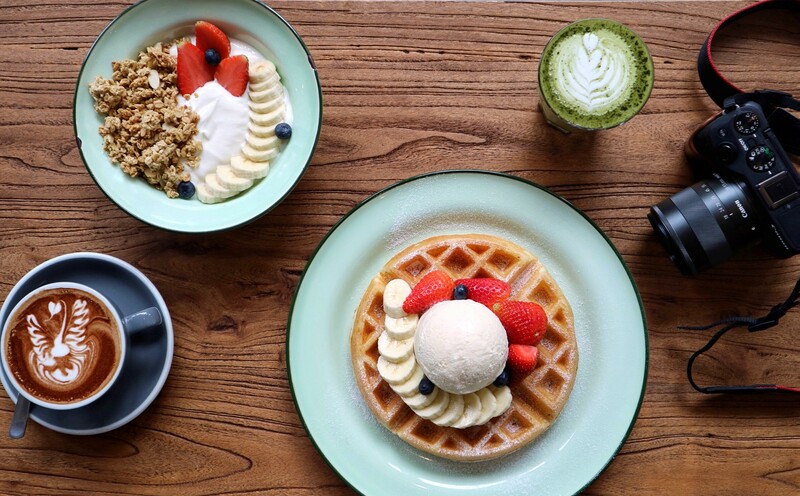 Adding to that list is Wakey Wakey – a new hipster and laid-back cafe that serves really amazing coffee and pastries (for now). Opened by the team behind Stranger’s Reunion & Curious Palette, Wakey Wakey is currently running on a tipping basis while awaiting approval before their kitchen can fully operates. So, do keep a lookout on their social media page! Meanwhile, you can still chill and relax at the cafe while enjoying a good cup of Matcha Latte (my bias). Even though Wakey Wakey is only opened for a week now, I’ve already seen countless postings on social media. Finally visited this new hyped cafe during the weekends and I must say, I’m re-charged! Coffee was amazing! Since their kitchen wasn’t ready, they only serve cakes, waffle and yoghurt granola bowl. Waffle was really good! It was soft and fluffy on the inside, and crispy on the outside. Vanilla bean ice cream was aromatic and not overly sweet. Paired with my favourite fruits, this is what breakfast should always be. If you’re looking for a lighter breakfast, Wakey Wakey is currently offering yoghurt granola bowl. Granola was amazing! I will definitely be back for their mains when their kitchen is ready! Looking forward to impressive creations!